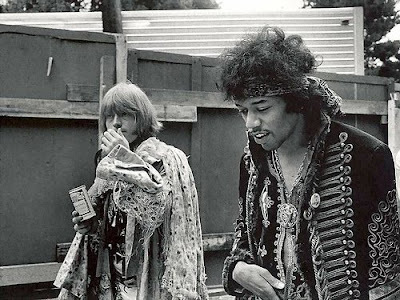 Before the whole idea of rock concert festivals really took off with Woodstock, there was the amazing mind-blowing success of the 1967 Monterey Pop Festival, and it was documented freakily by D.A. Pennebaker. An outgrowth of the Monterey Jazz and Folk festivals, which were very intellectual, beatnik-approved enterprises, the pop festival was a kind of spearhead for a new form of cross-genre free-form sound; the jazz and folk stamp of 'intellectual art' approval was finally given to "pop," an art form to be considered equivalent to any other--from opera to cubism--as culturally relevant, profound and, like, deep, baby. Prior to Monterey Pop, rock/pop was largely the province of screaming kids and mop top haircuts; the intellectual hipsters of 1965 even booed Dylan when he went electric at Newport Folk Festival. But two years or so had passed since then and America was finally 'ready' to see rock, jazz and folk all merge together in a big paisley shawl. Oh and did I mention that the best acid in the world was being handed out at the entrances, in little purple dots scooped in handfuls out of big buckets, like penny candy to an endless parade of trick or treaters? Mmmmmm, purple. And to prove acid made you groovy, the whole event went off with poetic grace and perfection and is all captured beautifully on the D.A. 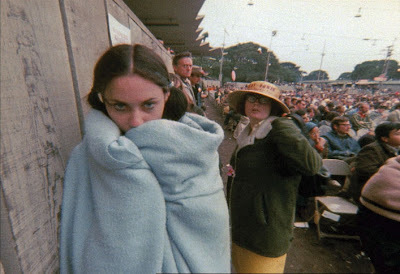 Pennebaker documentary, MONTEREY POP, so even if you weren't there, you can always go visit, like, back through time.... There's none of the bad tripping and face clawing or Hells Angels bashing that would make Altamont such a disillusioning disaster; no hairy nudists doing yoga or rambling stage announcements like at Woodstock, just Owsley's purple hazeless purity and enough chairs for everyone to sit down and zone out rather than having to stand all freakin' day. The vibes were so good at Monterey that the musicians themselves transformed their performances to reflect each other's in the moment; you can hear the effect of hearing the band that came before on the sound of the next; the vibe becomes to strong it shatters the walls between all nations, times, styles, and dimensions. We start out with folk festival tambourines and harmonies and it comes out Hendrix - and we never look back. If you're watching the film now, decades later, on acid, you can still feel the immediacy, the openness, and if you get lost, the constant cutting to enraptured beautiful female faces in the crowd will bring you back and glue you to your chair with warm sexual-maternal epoxy. The fuzzy feedback drenching of Hendrix comes in later and wipes all the blood away and leaves just a neck and a cigarette where your head has been. And then... then... now... Ravi Shankar starts. At first it's just Indian raga music playing as a roving camera tracks its way down the aisles of the festival seating area. Everyone seems a big hung over and bleary-eyed from the past two days; some are half-asleep in each others' arms, buried blankets, smoking off into space. Only gradually over the 18 minute-long excerpt of Shankar's four hour set do we begin to even realize someone's onstage and we're not just hearing some background score to the images. By the time we see him-- his beautiful, vaguely Satanic-looking brown face enraptured in quiet flowing ecstasy--we're hooked. The music slowly re-ignites our burnt-out prana for one last roll; and then the flame lights up the chakras of the whole crowd for one final collective flash of evolutionary light. No one would have been surprised if aliens came down at the end to welcome the crowd into the galactic brotherhood. And after them a still wider radius, God's own Gods, endless circles in and back around. Shankar himself must have seemed pretty alien, for this was long before yoga's popularity (outside of SF) or the popularizing of the 'New Age' in the west. 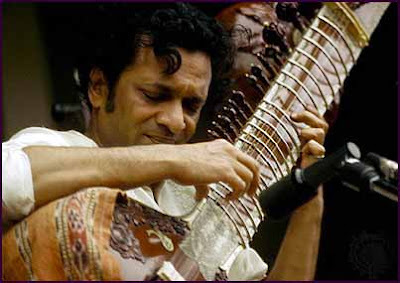 Seeing Shankar's massive and formidable-looking sitar for the first time, on acid, must have felt like seeing a giant black centipede make love to the fingers of an ageless wizard. After three days of dorky guys in flower face paint standing around wonking out old folk standards on boxy electric guitars, suddenly vision itself dissolved into the nether regions, the great beyond, the Burroughs-ian interzone of NAKED LUNCH. The eerie droning, spine-tingling sound of the sitar is somewhere between a flanger-pedaled electric guitar and a barber's electric razor buzzing on the back of your neck, and that's when you're straight! On acid the sitar's otherworldly tones are no less accessible or strange than anything else that's come before in the more melodic tradition in the festival, from the sonic feedback textures of Hendrix to the gentle entwined harmonies of Simon and Garfunkel. Acid makes the normal completely strange and the strange... whoa... normal. At the climax of Shankar's raga the audience is suddenly caught completely up in this onstage frenzy: precision ecstasy so mind-boggling that the close-ups of Shankar's finger-picking hand just show a hummingbird blur. Of course there are musical high (way high) points other than Shankar: Janis Joplin's career-making poetic passion and mytho-bluesetic fury in "Ball and Chain" being one of my all-time favorite concert moments; and low points like Canned Heat, and Country Joe's "psychedelic" instrumental. But the lows aren't very low and the highs are so mind-bogglingly high that you may as well forget trying to top them. The songs all fit together with the imagery both on and offstage thanks to seamless, lyserigically inspired editing and groovy lightshow projections creating hall of mirror linkage. There are so many beautiful crazily-dressed people just grooving and being themselves here that the film never gets boring no matter how many times you see it. A continual wellspring of love vibes, a freeze frame fountain of eternal youth (several of the top players would soon be dead but they're not dead yet), this crowd is far from the shambling bugged-out zombies they would--a couple short years later--become once Owsley wasn't there to ensure an LSD gold standard. Pennebaker shot the film by using synced sound with numerous roving 16mm color cameras. The result allows him to cut amongst a wide range of material and have it all fit, so it takes a lit mind to perhaps divulge just what his hang-ups are, since it flows so well, it's just about love, baby! That's why it can't fail, why it can't be anything but terrific. The love Pennebaker has for the material is achingly clear. He's not afraid to cut from the middle of one song to the middle of another by a completely different artist if it works, or linger on Janis' feet during half her song, and the result makes perfect sense in a kind of drugged chronology of memory way. This is what recollections of a concert are like if you were there: faces, fur hats (the 1950s fake fur Daniel Boone hat craze had undoubtedly ensured the Haight-Ashbury vintage stores were well-stocked), psychedelic art for sale outside along the fence, light shows, colorful plumage, Brian Jones. 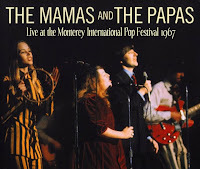 Speaking of Papa John, he was one of the founders of the festival and you can tell by his eyes when his band, the Mamas and the Papas, are playing that he's having a blast. Re-watching this recently with someone I totally dig (and who digs the Mamas and the Papas), I saw them in a whole new light: Over the years I had come to consider their songs mere filler, but with a cute Mamas and the Papas fan by my side I let go of worldly cynicism and found myself swooning for their passionate but sweetly laid-back harmonies. All it took was to let go of the way I'd learned to tune out "Monday Monday - Bah Bah" on FM radio all my life, and to allow myself to hear them again as if for the first time. Isn't that what it's all about, anyway? One thing we've kind of forgotten in our age of mercurial one hit rock stars is that before 1967 folk acts like Peter, Paul and Mary used to be on every cool person's LP player. In other words, real cool is totally sweet and open, not guarded and brooding. When Paul Simon and Art Garfunkel sing "Homeward Bound" you can hear their love for the music, the crowd, and each other in the minute mellow of their combined voices; every syllable is completely in the moment. These artists love singing together. They do it well and they know the songs, both lyrically and as pure music. Their faces light up with the joy of harmonizing, the joy of being good at something, as opposed to the "here I am, ladiez! Let me hear you say 'Hey, Ho!'" of our tru-tone-deaf pop stars today. Of the four main singers in the Mamas and the Papas, Mama Cass is the only heavy mama and yet the band all wear floor-length mu-mus for what I can only assume is a gesture of solidarity; they love her so much they widen themselves just so she never thinks she doesn't belong. Even when they sing "The Joke's on You," a combination critique of liberal naiveté and acidic breakup speech. With the Mamas and the Papas, even a bad break-up song overflows with free-spirited love, while in the music of the disillusioned eras to follow, even love songs sound gloomy and dispirited. Which way would you rather have it? Wouldn't it be great if Owlsey brought his purples to a Conor Oberst/Bright Eyes show? Damn, man. My name is Rich and I'll be 65 years old this month. 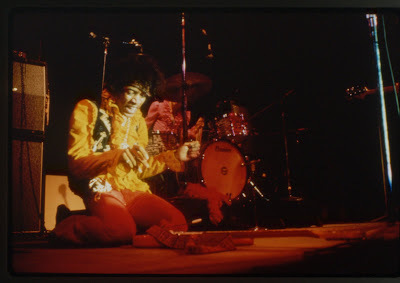 I was at the Monterey Pop Concert in 1967. I forget which night it happened, perhaps Sunday night. I was 17 and the Police marched through the Fair grounds in their riot gear swing their sticks and beating everyone, Kids, Girls and young Men like myself who had done NOTHING WRONG or broken any laws. I remember they said RUN, RUN, RUN! I could not run since I recently had knee surgery and actually had my right knee cap (patella) removed due to a sports injury. One cop beat me with his baton and broke my right arm as only tried to protect myself. After I was beaten bloody the remaining army of riot cops simply marched over me and a couple more proceeded to kick me while I was down on the ground. I did not resist or even try to fight back as I honestly believed they would have killed me. After the army of cops passed I was finally able to get up on my feet and make my way out of the Fair Grounds. As I was walking down the street another cop on a tricycle stopped and asked what had happened to me. I told him my story and he gave me ride on his tricycle to a Hospital ER. They fixed me up, bandaged my face wounds set my arm and put it in a cast. Where were other kids there who were also beat and abused up by the Monterey cops and required medical attention. I called my Dad who picked me up at the Hospital and took me home. I committed no crimes and was not arrested. This is a true story of my life experience at the Monterey Pop!!! We talked to Attorney who advised we would just waste our money with a suit against the City and when become a target for police. Anyone else out there who was abused by the Monterey City cops??? I would like to hear your story. Perhaps the Monterey cops are better these days? Peace to you my Brothers & Sisters who lived thru the 60's. good old attorney. why don't cops ever beat them up? if the cops had beat the attorney, it would be worthwhile to "pursue it".